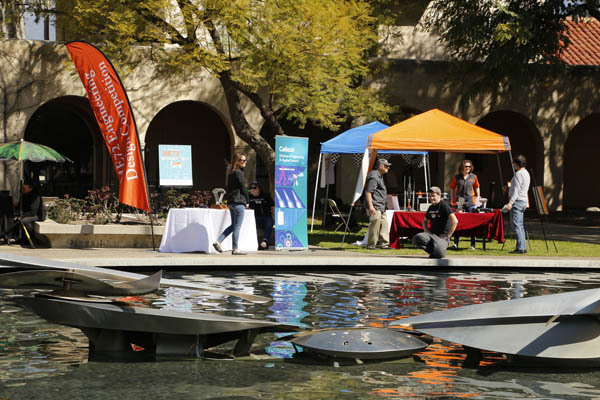 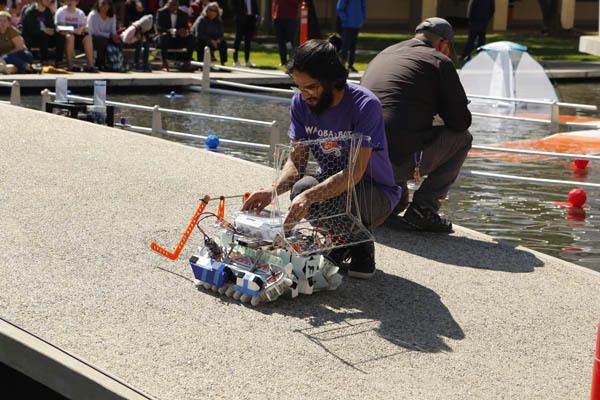 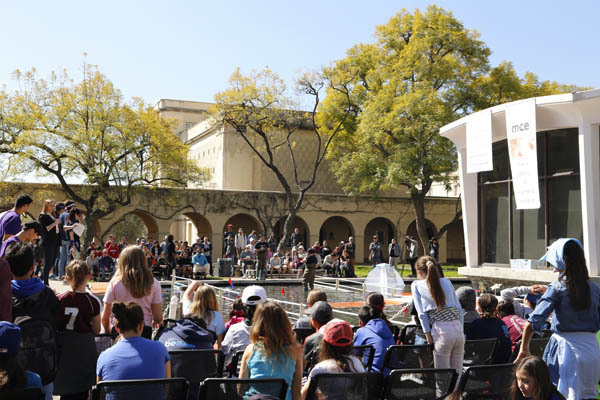 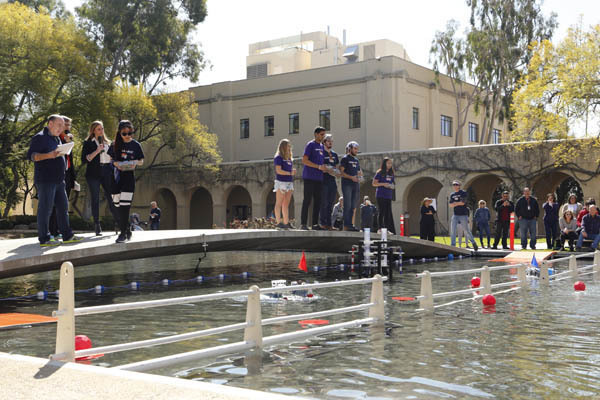 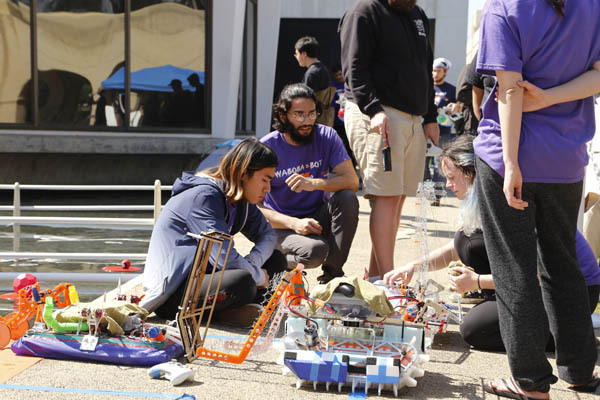 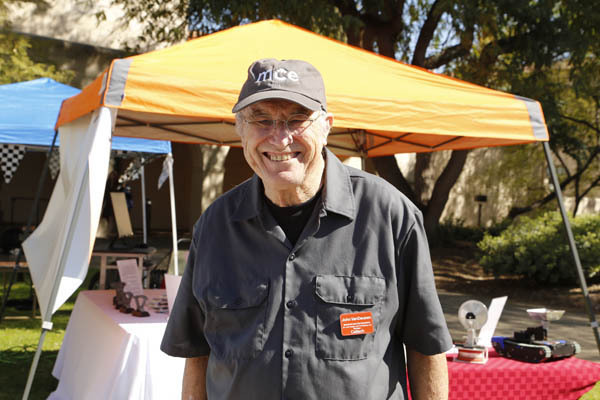 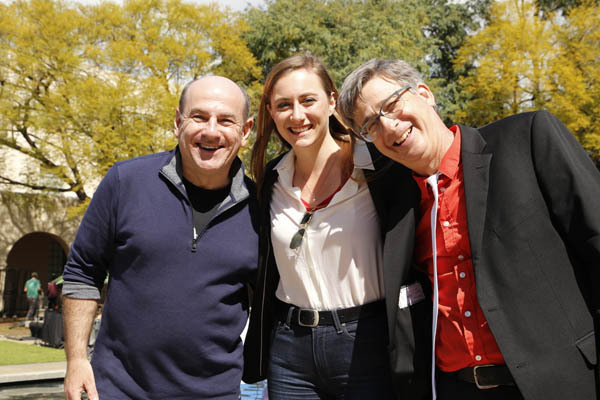 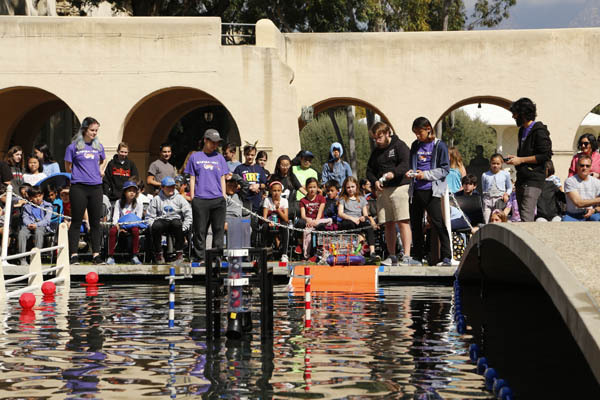 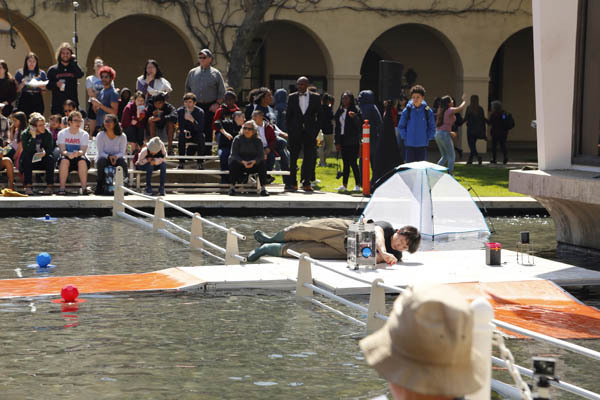 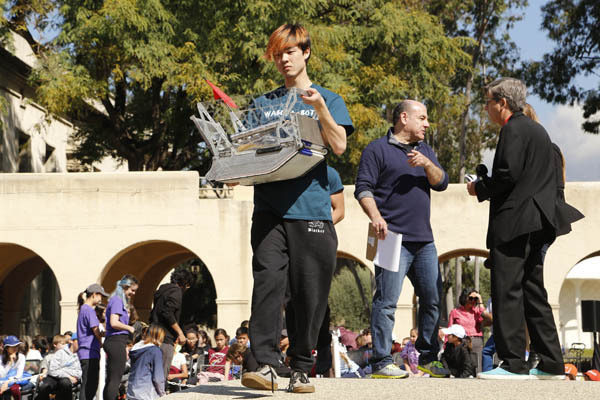 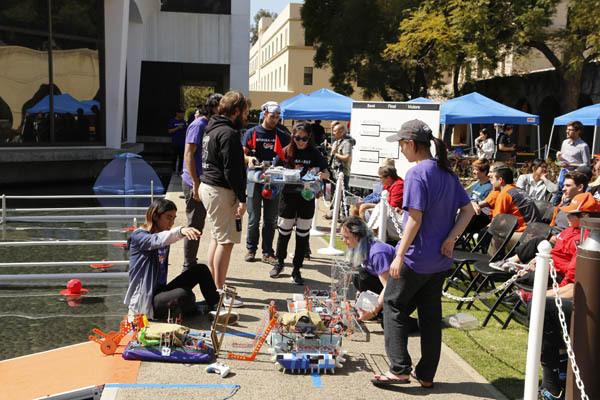 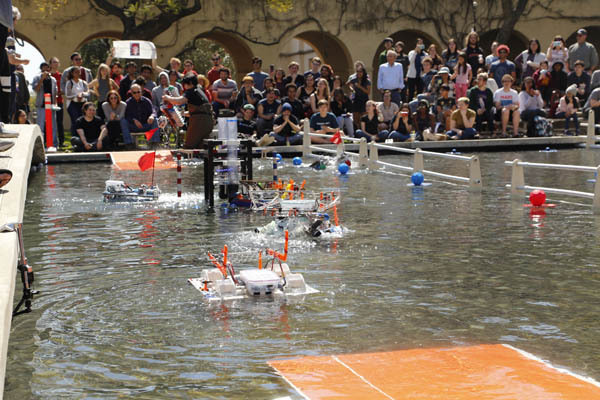 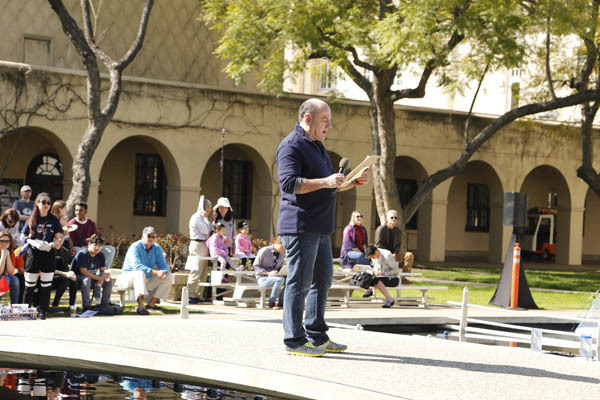 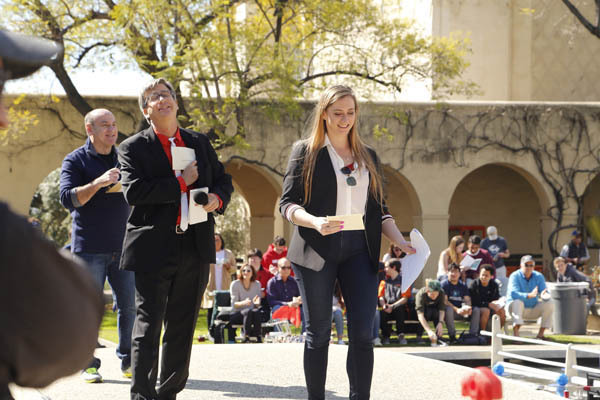 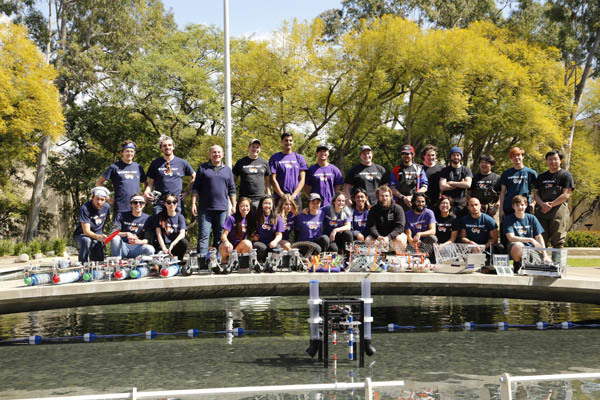 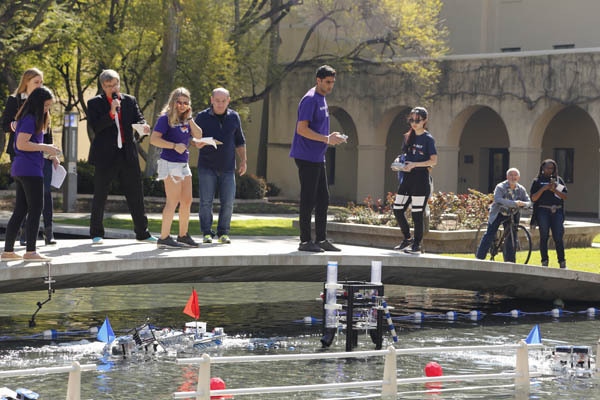 Teams must design, build, and operate three amphibious, radio-controlled robotic vehicles to navigate the competition arena within the 42-ft x 51-ft rectangular section of Millikan Pond located between the east wall of the Millikan library and the arched pedestrian bridge. 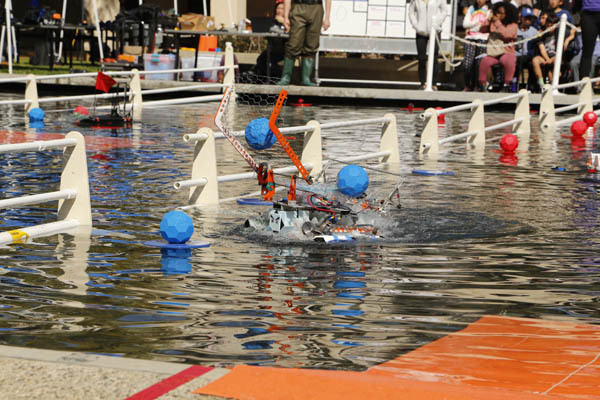 Robots must successfully navigate the structural and water environments, scoop up floating Waboba balls, and Vex Buckyballs, and shoot or deposit them into designated scoring zones and goals. 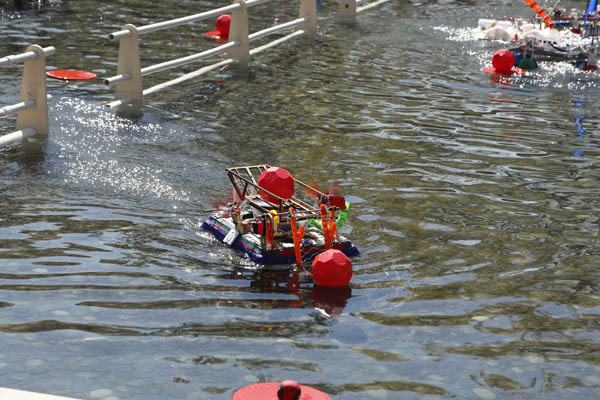 Additional aspects of the game involve navigating onto “Millikan Island” to rescue the Golden Waboba ball and fire cannons which release extra red or blue Waboba balls in to play. 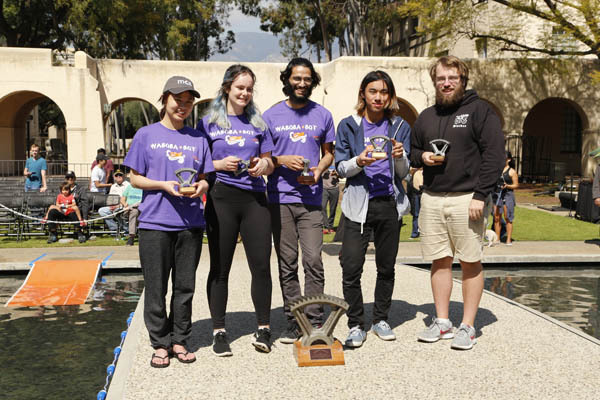 Each team's mission is to outscore their opponent during 5-minute head to head matches during round robin and single elimination rounds and ultimately win the 2018-19 ME72 competition. 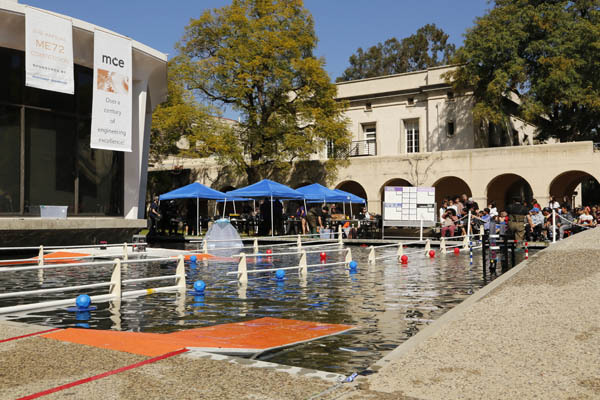 The competition arena within the pond is divided into three (14-ft x 51-ft) rectangular primary zones separated by PVC pipe barriers. 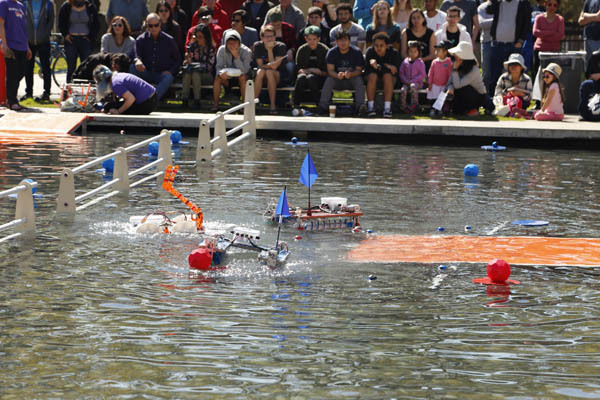 At the start of each match, teams will direct their three amphibious robots down opposing entrance ramps and race toward the Waboba ball tower in the center of zone 1. 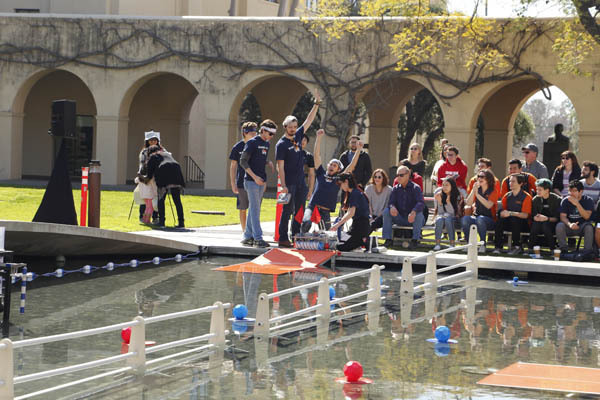 The first team to strike their bar pendulum will trigger the ball tower to release six of their designated (red or blue) Waboba balls into the water. 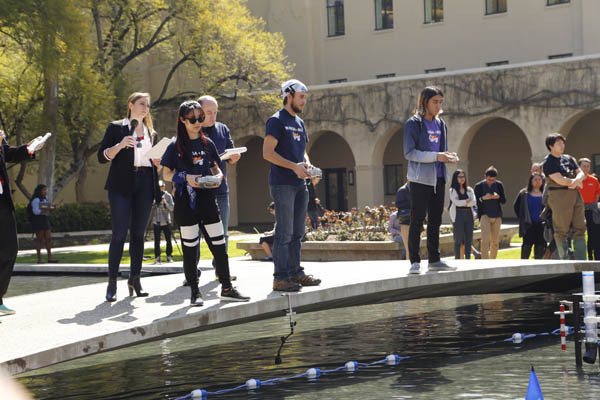 The ball tower will release six of the opposing team’s oppositely colored Waboba balls after a 15-second delay. 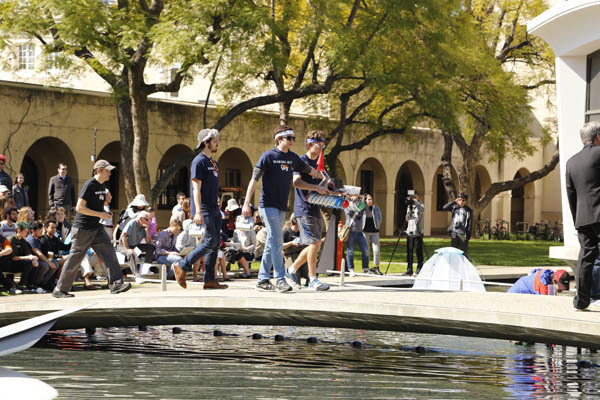 There will be additional (60mm diameter) Waboba balls and (127 mm diameter) “Buckyballs” stationed atop anchored “lily pads” in zone 1 and zone 2. 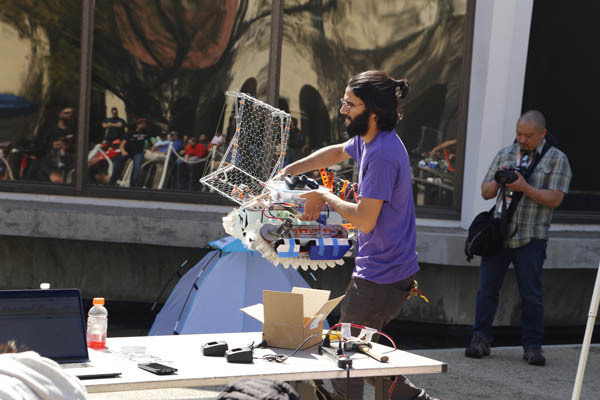 Teams can accrue points by scooping Waboba balls and Buckyballs and transporting them into zones 2 and 3. 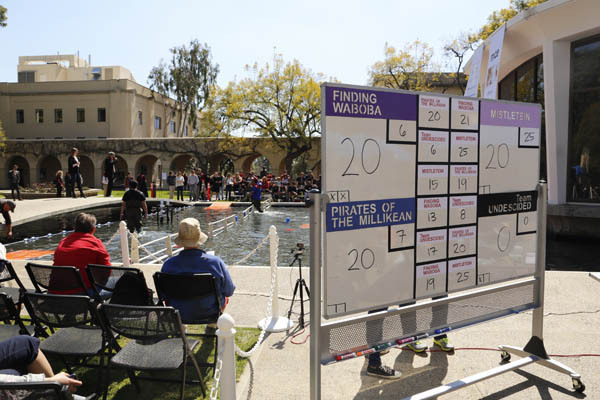 Waboba balls placed in zones 2 and 3 are worth 1 point and 2 points, respectively. 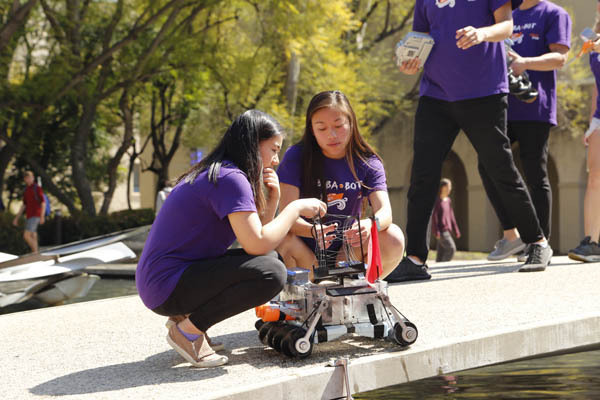 Buckyballs in zones 2 and 3 are worth 2 and 4 points, respectively. 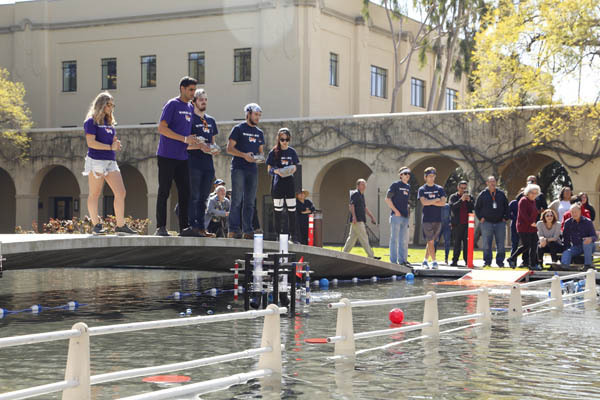 Teams may also remove their opponent’s balls from a scoring zone to reduce their opponent’s overall score. 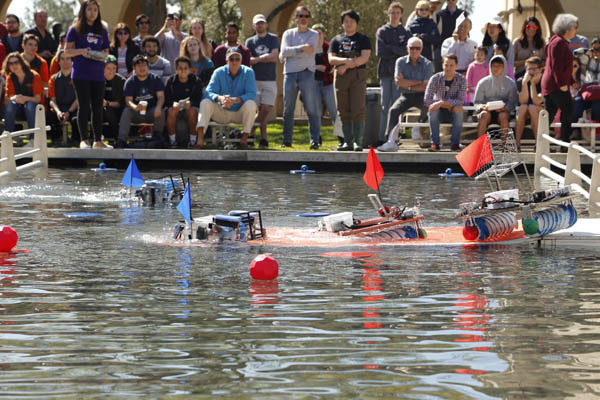 E.g., move opponent’s balls from zone 3 to zone 2 or from zone 2 to zone 1, etc. 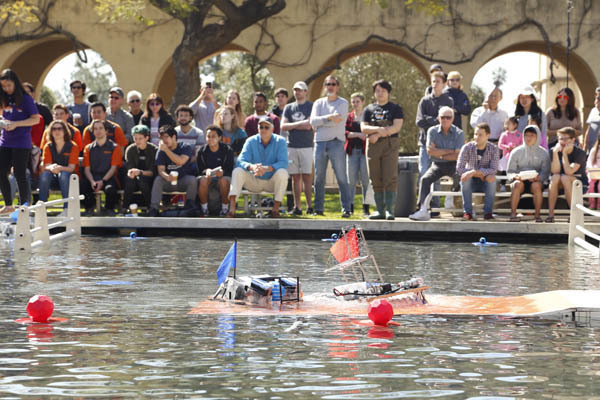 Teams may also score by successfully depositing Waboba balls and Buckyballs into anchored, floating “Quad goals” positioned in zone 3. 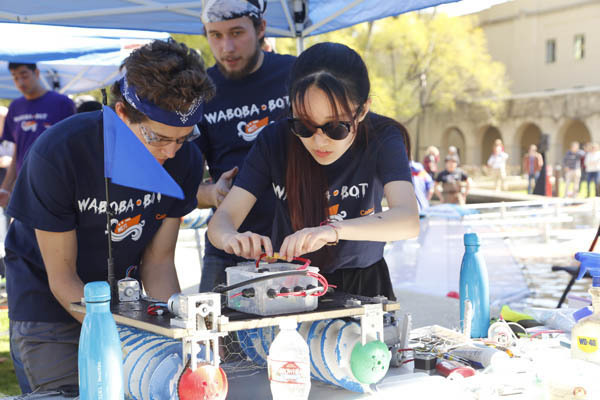 Waboba balls and Buckyballs deposited into a Quad goal are worth 6 and 8 points, respectively. 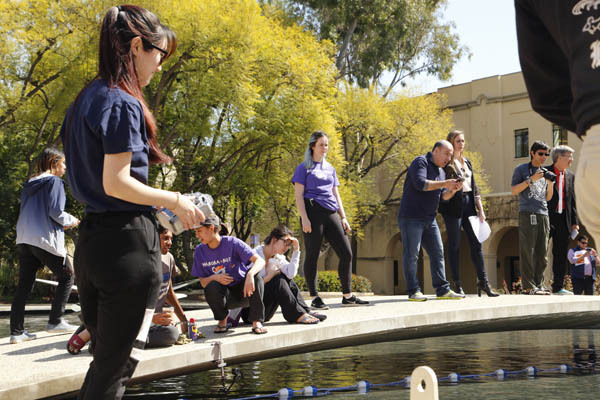 A third unique scoring opportunity involves obtaining the “Golden Waboba” from Millikan island treasure chest. 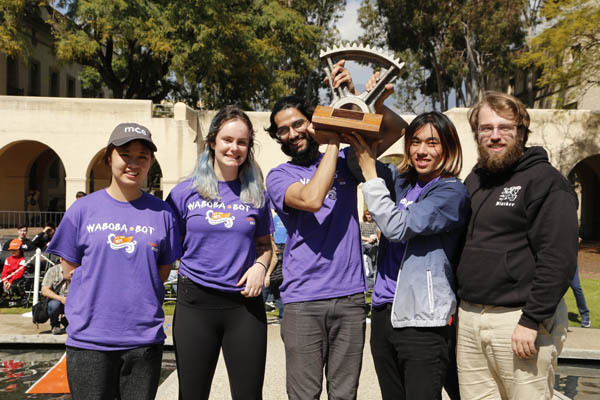 Golden Waboba points are awarded based on where the location of the Golden Waboba at the end of the 5-minute match. 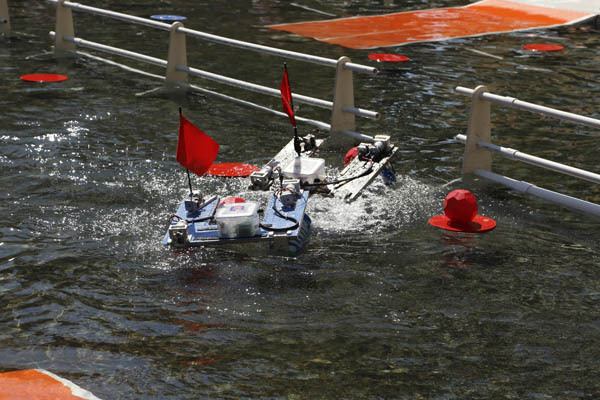 Robots which successfully navigate onto Millikan island can trigger cannons which fire extra red or blue Waboba balls into play. 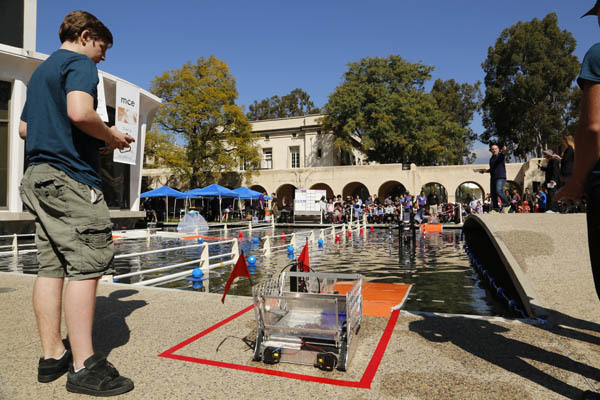 Each team must design and fabricate 3 hybrid (amphibious) robotic vehicles capable of traversing from dry land to water and vice versa. 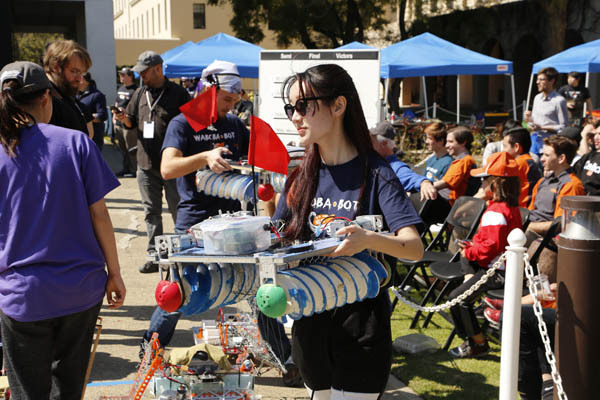 Robot tank dimensions may not exceed a 20-in long, 20-in wide rectangle when on the ground. 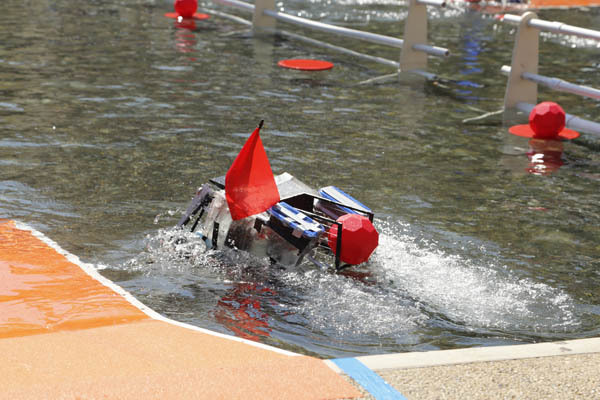 During gameplay, the robot may expand to a height which cannot exceed the height of the PVC zone dividers. 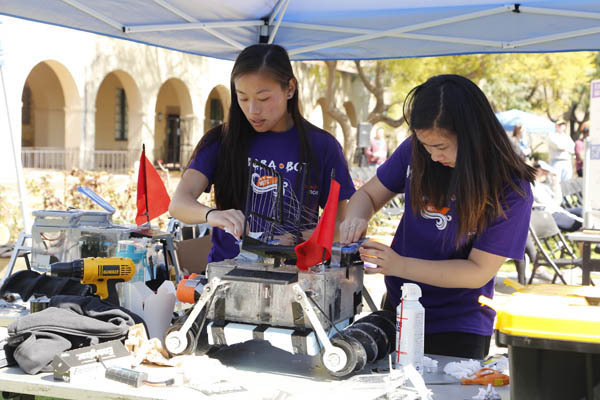 Robots must have an integrated ball handling mechanism to scoop, transport, and dump balls at various points throughout the course. 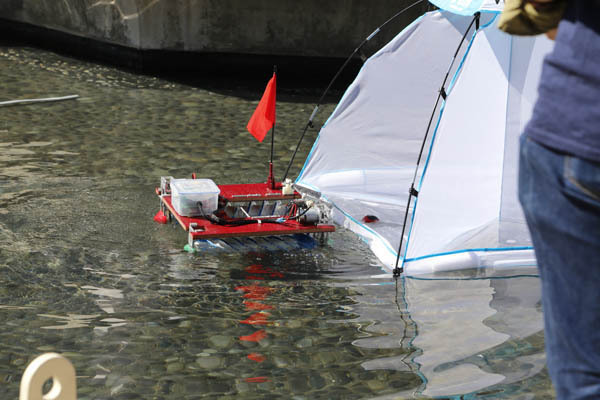 Electronic components and batteries must be sealed and protected from the water environment. 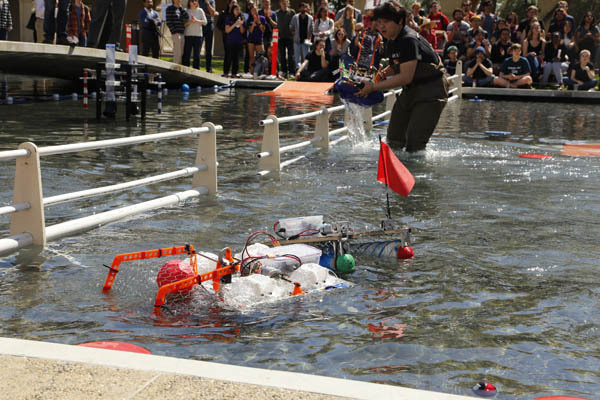 Propulsion systems must be developed with sealed designs which prohibit the vehicle from taking on water.